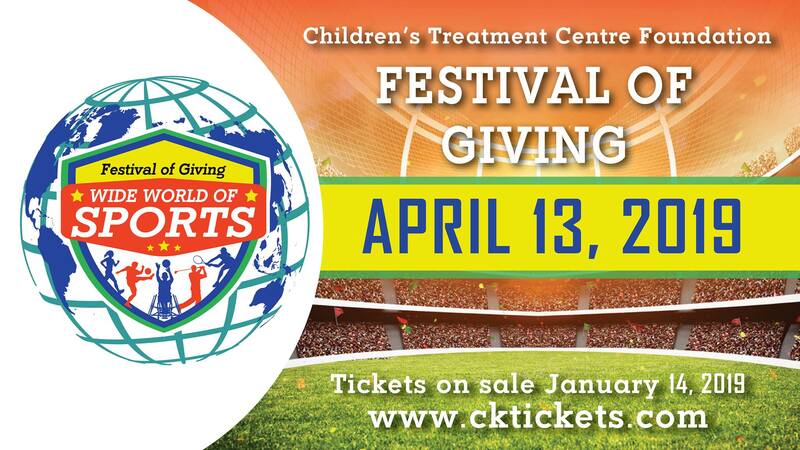 On April 13, 2019, the Children’s Treatment Centre Foundation is hosting its 18th annual Festival of Giving! This year, The FOG committee spanned the globe to bring an event that will both entertain and inspire! From the thrill of victory to the agony of defeat, Festival of Giving’s Wide World of Sports will feature top-notch entertainment, speciality drinks, food, silent and live auctions, and fundraising! Tickets go on sale to the public beginning Monday, January 14, 2019 at 10:00 am. • CK Tickets allows guests to select their own table and seat numbers upon payment. Please organize your groups ahead of time to ensure you’re seated together. • All tables seat 10. If you require a table of 12, please contact the Foundation in advance at 519-354-0520 x 215. • All ticket sales and seating arrangements are final upon payment. The Festival of Giving has evolved into one of Chatham-Kent’s most premiere events, annually attracting over 1,100 guests and volunteers, hundreds of auction items, and raising on average $225,000 annually. The lead organization, and primary beneficiary of FOG, the Children’s Treatment Centre Foundation of Chatham-Kent, works to raise community awareness and funds for the Children’s Treatment Centre, which provides quality care to children in our community who have physical, developmental, or communication challenges.